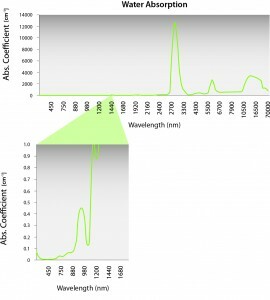 What Wavelengths of Light are the Best for Photobiomodulation (PBM)? As opposed to white light which contains a broad range of wavelengths, laser light has a specific wavelength. The unit used to measure wavelength is nanometer (nm). 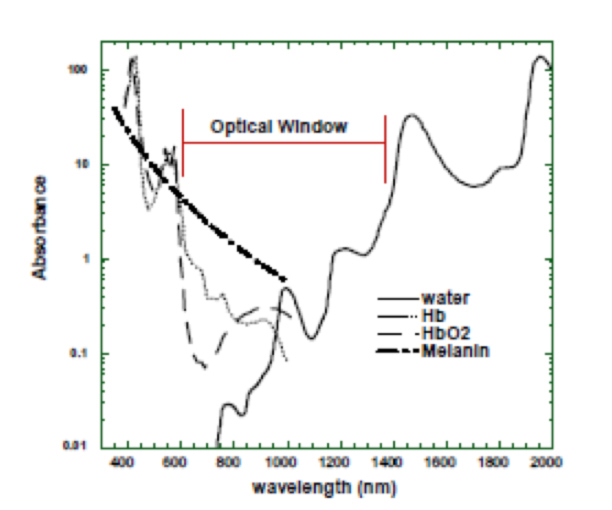 Much research has been done to investigate how melanin, blood, fat and water absorb light and this has lead researchers to define a window or range of wavelengths through which light can penetrate biological tissue. This window is referred to as the optical or therapeutic window. Typically plots of the optical window are shown on a log scale, which deceptively maximizes peaks below 1 and minimizes peaks greater than 1, shown in Figure 1. Plotting on a log scale allows for a wide range of intensities to be plotted. However, the log representation of the data can be misinterpreted, for example, looking at the absorption values from the plot, you can see that below 1000 nm, the absorbance of water is less than 0.5. The differences in the water absorption are better viewed on a linear plot. Figure 2, below, is a plot of the water absorption on a linear scale. The lower plot is a magnification of the region between 450 nm and 1400 nm. There is a small peak at 980, but it goes up to a maximum of 0.4. The absorption is dominated by melanin in the skin. 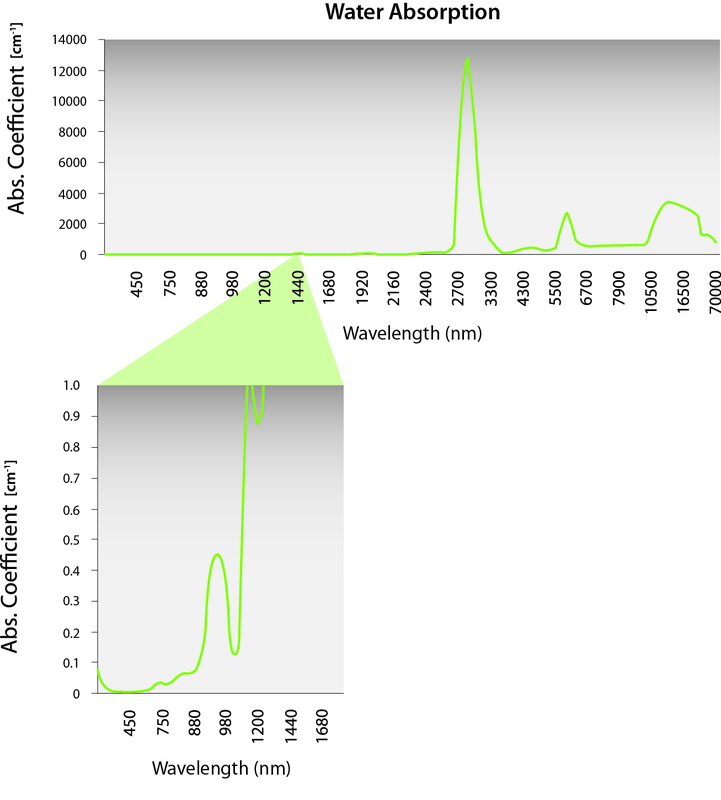 Both 810 nm and 980 nm are in the “optical window” where the absorption by other chromophores is minimized. Both of these wavelengths are in the therapeutic or optical window and are effective for laser therapy. Since melanin absorption dominates at lower wavelengths, 980 nm is better for maximal penetration for skin with melanin. LiteCure’s CTO, Luis DeTaboada, has also done modelling of the penetration depth of the various wavelengths of laser to compare them. Data generated from Hale and Querry. Optical constants of water in the 200 nm to 200 μm wavelength region. Appl. Opt. 1973; 12: 555-563. 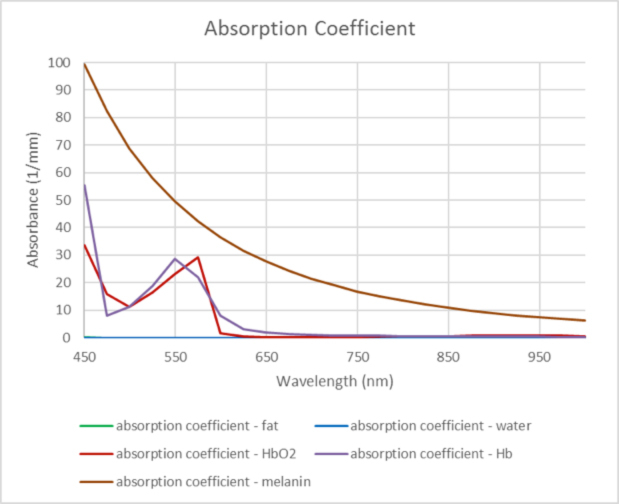 Figure 3 shows a plot of the various absorption coefficients as a function of wavelength on a linear scale. This shows the dominance of melanin absorption compared to hemoglobin, oxyhemoglobin, water and fat. Generally, red light (600 nm to 700 nm) can be used to treat the conditions near the surface of the skin, but light in the 800 nm to 1000 nm is needed to reach deeper tissue structures. Linear plot of Absorption Coefficient vs. Wavelength. Data for the absorption coefficients were obtained from Oregon Medical Laser Center, http://omlc.org. The main components in the tissue that absorb light are: melanin, oxyhemoglobin, deoxyhemoglobin, fat, and water. Melanin absorbs light strongly in the lower wavelengths, so dark skin will absorb more light, especially the wavelengths from 500 nm to 800 nm. Wavelengths longer than 1200 nm are readily absorbed by water. Lasers with these longer wavelengths are typically used in ablative procedures such as surgery or skin resurfacing. Current understanding of photobiomodulation is that light in the wavelength range of 800 nm to 1000 nm is capable of penetrating the skin and surface tissue and reaching the muscle below. LiteCure lasers typically emit a blend of 810 nm and 980 nm light. For treatment selections of dark skin (and/or dark fur (animals)), the laser will automatically shift to all 980 nm light; thus minimizing the amount absorbed by melanin.